I used to be quite comfortable in high heels, but unfortunately that has changed. I’m working on changing that now, so I put a pair of heels at work so I can walk around in them for at least a few hours everyday. The goal is to be able to wear a nice pair of high heels at my friend’s wedding in the end of June. The biggest reason I don’t trip around in my old beauties is that I discovered Converse. It was about nine years ago when I started a new school and chose to be in a music class that these shoes came to my attention. They were very popular (I think everyone in my class owned a pair, most of them didn’t use anything else). It wasn’t a choice for me not to try them. Once I did I was hooked. I have quite a few different colours and patterns by now. Not sure yet if the collection will grow this season though. That depends on how my high heel-project end up. 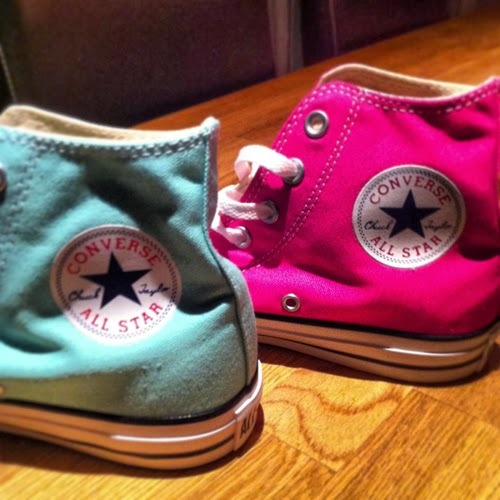 This entry was posted in Fashion and tagged Converse, Shoes by Anna S. Bookmark the permalink.